Club Penguin Cheats by Mimo777 Club Penguin Cheats by Mimo777: Gary Sends Club Penguin EPF Message! Hey mimo, I've heard that the sports shop will be returning in 2012! Also, I hope we get awesome missions instead of field-ops! I wonder if Herbet gives up trying to melt club penguin! I hope there'll be new missions^^! I'm sure 2012'll be better than this year...? Hey Mimo!On what servers do you usually go on?I really want to meet you.A happy new year,mimo,you are awesome! Hi Mimo just a little easter egg secret or what ever on club penguin open your friends list and type in Klutzy then read what comes up, then type in Herbert P Bear then see what comes up its really funny LOL. btw if you didnt know this can i please have credit thanks mimo your awesome!! Hey Pingy Ping!! That happens to me sometimes and it usually changes when I switch the Internet Browser for example: Google Chrome. Maybe Mozilla Firefox or Safari or MSN or one of those will work. And about that Sports Shop opening. I'm so exited!! And I guarantee you Herbert is coming back cause imagine how boring that would be without Herbert causing mischief!! Hope my advice works Pingy Ping and Happy new Year to everyone I know! Mimo!! The Storm Cloud outside the dojo is now diffrent!! yo mimo! you may already know that if you write in your frindslist search Klutzy or herbert P bear something funny is written there. if you write rockghopper or senei it tells you to meet him on the island to add him as a friend. BUT if you write Dot or Jet Pack Guy it says MEET HIM ON THE ISLAND to add him as friend!!!! new missions are coming WOOT! The sports shop returning? That would be so cool! I do hope that the missions return (PSA) they were more fun and certainly more challenging. Perhaps EPF VS. PSA! 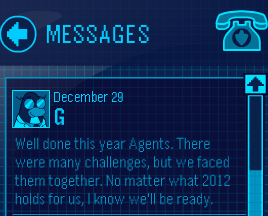 Actually you can still play PSA missions by going to the VR Room from the tube transport in the EPF Command Room.